Receive a $60.00 Visa prepaid card when you purchase a set of four Vredestein Quatrac 3 Tires (in V Speed Rated Sizes), four Wintrac 4 Xtreme Tires or four Wintrac Xtreme tires from October 15, 2013 through November 30th, 2013. Save on Vredestein Tires now! Get $60 Back by Mail with the Purchase of four Geolandar H/T-S, four AVID Ascend or four AVID Envigor tires from October 14, 2013 through November 17, 2013. 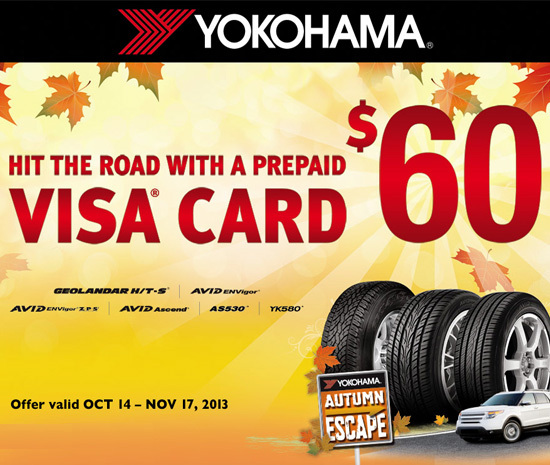 Save on Yokohama Tires now! 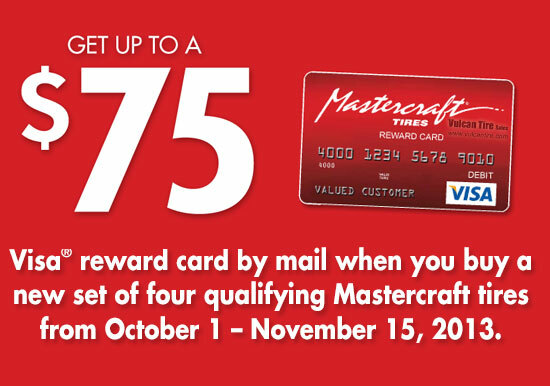 Receive up to $75 by mail when you purchase a new set of four (4) Mastercraft HSX Tour, Mastercraft Courser HTR, Mastercraft Courser HTR Plus, Mastercraft Avenger Touring LSR, Mastercraft Courser AXT or Mastercraft Courser C/T tires October 1, 2013 through November 15, 2013.